Targum to Zech. xiv. 9 and Ob. 21; "Malkut Shaddai ": 'Alenu; and "Malkut Shamayim": Ber. ii. 2, and elsewhere in Mishnah and Haggadah): Reign or sovereignty of God as contrasted with the kingdom of the worldly powers. The hope that God will be King over all the earth, when all idolatry will be banished, is expressed in prophecy and song (Ex. xv. 18; Zech. xiv. 9; Isa. xxiv. 23, Iii. 7; Micah iv. 7; Ps. xxix. 10), and with special emphasis in the later Psalms (xciii.-xcix.). God's Kingdom is spoken of in Ps. xxii. 29 (A. V. 28), ciii. 19, cxlv. 11-13; Ob. 21; Dan. iii. 33 (A. V. iv. 3); Tobit, xiii. 1; Sibyllines, iii. 47-48, 767; Psalms of Solomon, xvii. 3; Wisdom, x. 10; Assumptio Mosis, x. 1; Song of the Three Holy Children, 33; Enoch, lxxxiv. 2. The words "The Lord shall be King" are translated in the Targum, "The Kingdom of God shall be revealed"; and the ancient liturgy culminates in the prayer that "God may establish His Kingdom speedily" (see 'Alenu; Ḳaddish). 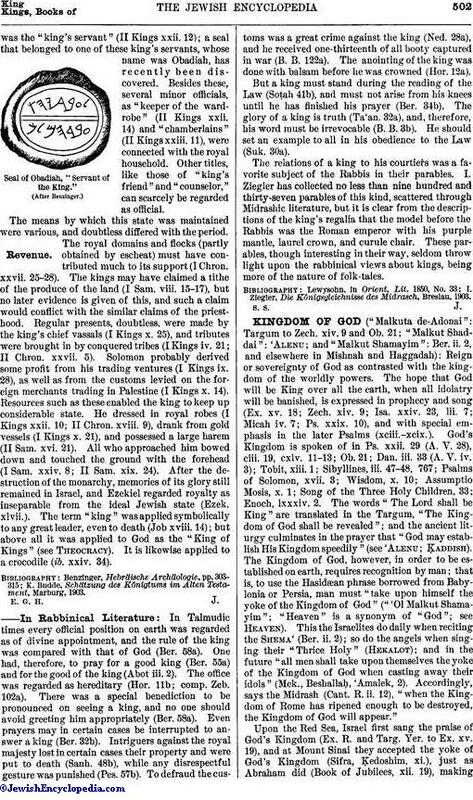 The Kingdom of God, however, in order to be established on earth, requires recognition by man; that is, to use the Hasidæan phrase borrowed from Babylonia or Persia, man must "take upon himself the yoke of the Kingdom of God" ("'Ol Malkut Shamayim"; "Heaven" is a synonym of "God"; see Heaven). This the Israelites do daily when reciting the Shema' (Ber. ii. 2); so do the angels when singing their "Thrice Holy" (Hekalot); and in the future "all men shall take upon themselves the yoke of the Kingdom of God when casting away their idols" (Mek., Beshallaḥ, 'Amalek, 2). Accordingly, says the Midrash (Cant. R. ii. 12), "when the Kingdom of Rome has ripened enough to be destroyed, the Kingdom of God will appear." Upon the Red Sea, Israel first sang the praise of God's Kingdom (Ex. R. and Targ. Yer. to Ex. xv. 19), and at Mount Sinai they accepted the yoke of God's Kingdom (Sifra, Ḳedoshim, xi. ), just as Abraham did (Book of Jubilees, xii. 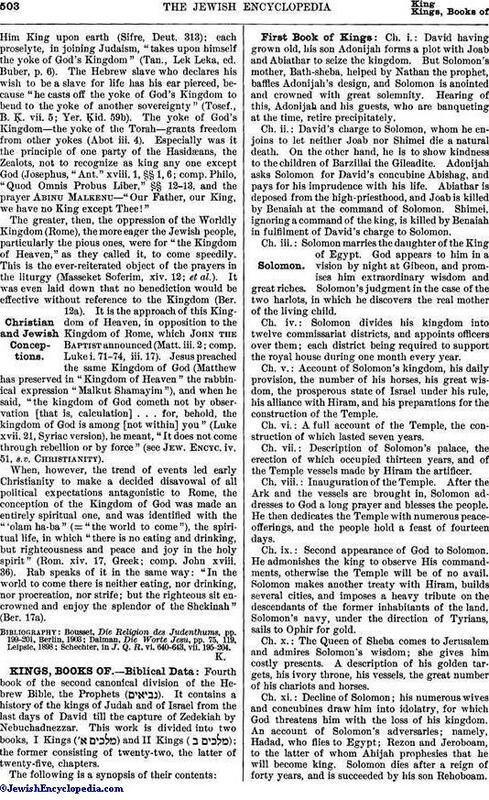 19), makingHim King upon earth (Sifre, Deut. 313); each proselyte, in joining Judaism, "takes upon himself the yoke of God's Kingdom (Tan., Lek Leka, ed. Buber, p. 6). The Hebrew slave who declares his wish to be a slave for life has his ear pierced, because "he casts off the yoke of God's Kingdom to bend to the yoke of another sovereignty" (Tosef., B. Ḳ. vii. 5; Yer. Ḳid. 59b). The yoke of God's Kingdom—the yoke of the Torah—grants freedom from other yokes (Abot iii. 4). Especially was it the principle of one party of the Hasidæans, the Zealots, not to recognize as king any one except God (Josephus, "Ant." xviii. 1, § 1, 6; comp. Philo, "Quod Omnis Probus Liber," §§ 12-13, and the prayer Abinu Malkenu—"Our Father, our King, we have no King except Thee!" The greater, then, the oppression of the Worldly Kingdom (Rome), the more eager the Jewish people, particularly the pious ones, were for "the Kingdom of Heaven," as they called it, to come speedily. This is the ever-reiterated object of the prayers in the liturgy (Masseket Soferim, xiv. 12; et al.). It was even laid down that no benediction would be effective without reference to the Kingdom (Ber. 12a). It is the approach of this Kingdom of Heaven, in opposition to the Kingdom of Rome, which John the Baptist announced (Matt. iii. 2; comp. Luke i. 71-74, iii. 17). Jesus preached the same Kingdom of God (Matthew has preserved in "Kingdom of Heaven" the rabbinical expression "Malkut Shamayim"), and when he said, "the kingdom of God cometh not by observation [that is, calculation] . . . for, behold, the kingdom of God is among [not within] you" (Luke xvii. 21, Syriac version), he meant, "It does not come through rebellion or by force" (see Jew. Encyc. iv. 51, s.v. Christianity). When, however, the trend of events led early Christianity to make a decided disavowal of all political expectations antagonistic to Rome, the conception of the Kingdom of God was made an entirely spiritual one, and was identified with the "'olam ha-ba" (= "the world to come"), the spiritual life, in which "there is no eating and drinking, but righteousness and peace and joy in the holy spirit" (Rom. xiv. 17, Greek; comp. John xviii. 36). Rab speaks of it in the same way: "In the world to come there is neither eating, nor drinking, nor procreation, nor strife; but the righteous sit encrowned and enjoy the splendor of the Shekinah" (Ber. 17a). Schechter, in J. Q. R. vi. 640-643, vii. 195-204.